Happy Thursday, crafty friends! 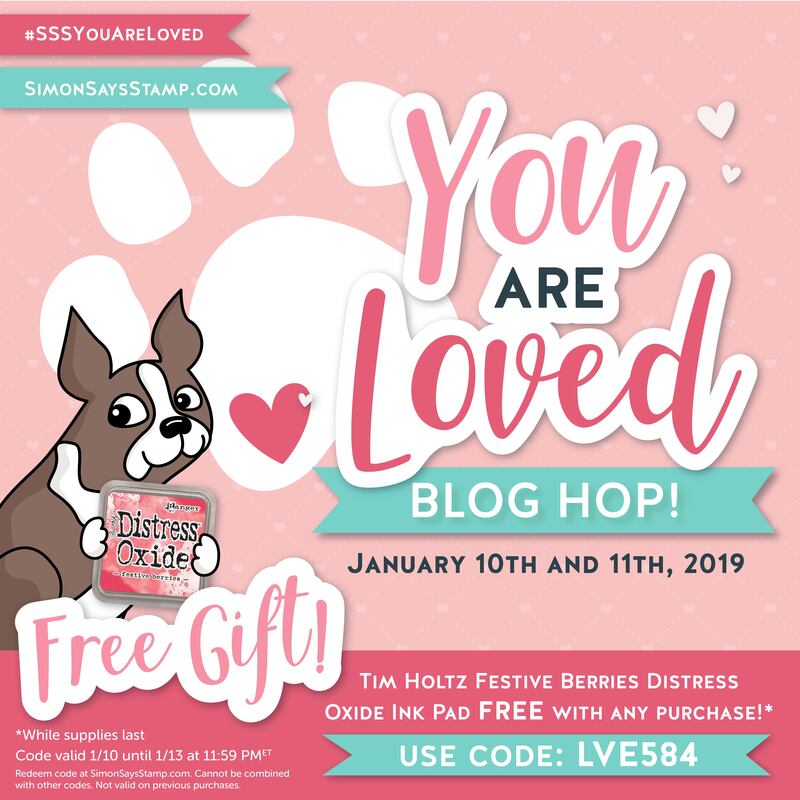 I’m excited to be back sharing inspiration featuring Simon Says Stamp’s You Are Loved collection and part of the blog hop they are hosting to celebrate the release! If you have already been hopping along, you should have arrived from the talented Nichol Spohr’s blog. Also! During this weekend, Simon is giving away a FREE Festive Berries Distress Oxide ink pad with any purchase! Use code LVE584 at checkout. The cards I created today feature the Windows to My Heart die, along with Simon’s new Simple Sentiments stamp set. My idea was to fill the windows with glitter paper, and I used a pink, purple and silver. For a layered effect, I popped the window panel up off my card and adhered the hearts recessed into the background. 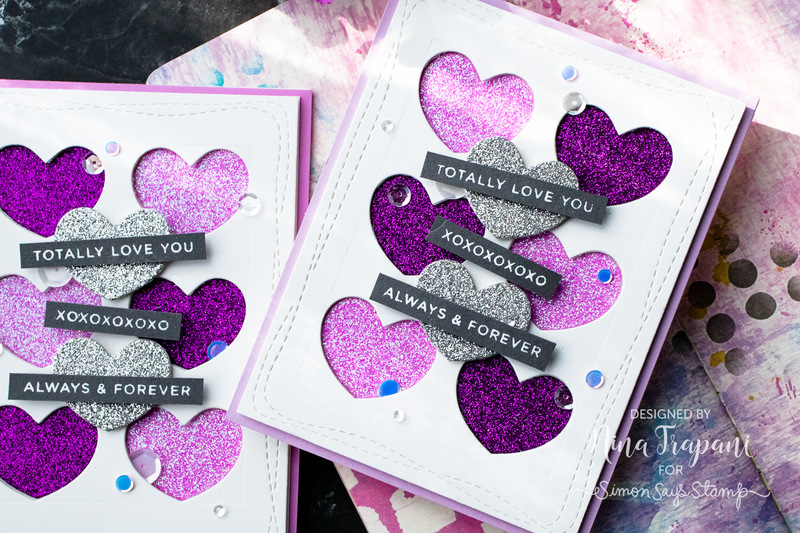 These glitter paper colors paired so well with Simon’s new, Girl’s Best Friend sequin mix! These sequins have some holographic-style confetti pieces that really draw out the colors in the glitter. 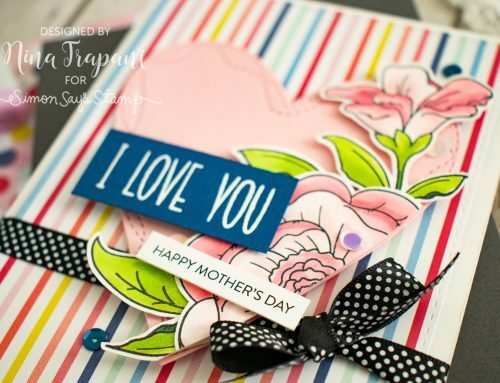 I love the playful greetings in the Simple Sentiments set; to go with the vertical design and the three rows of hearts, I white embossed three of the sentiments to layer across the card. I really had fun putting these cards together; they were pretty easy to create! If you would like to see how I made them, be sure to watch the video at the top of this post. I hope you enjoy it! And keep on reading to find out all the details about the Simon Says Stamp You Are Loved blog hop! Thanks for tuning in and visiting me today; I will be back again very soon with fresh inspiration to share! The next stop in this fun-filled hop is my talented friend, Jessica Frost-Ballas’ blog! You can find the entire hop order on the Simon Says Stamp blog. Simon is giving away a $25 gift card at every stop on the hop! For a chance to win, simply leave a comment! Winners will be chosen over the weekend and posted on the Simon Says Stamp blog on Wednesday, January 16th. 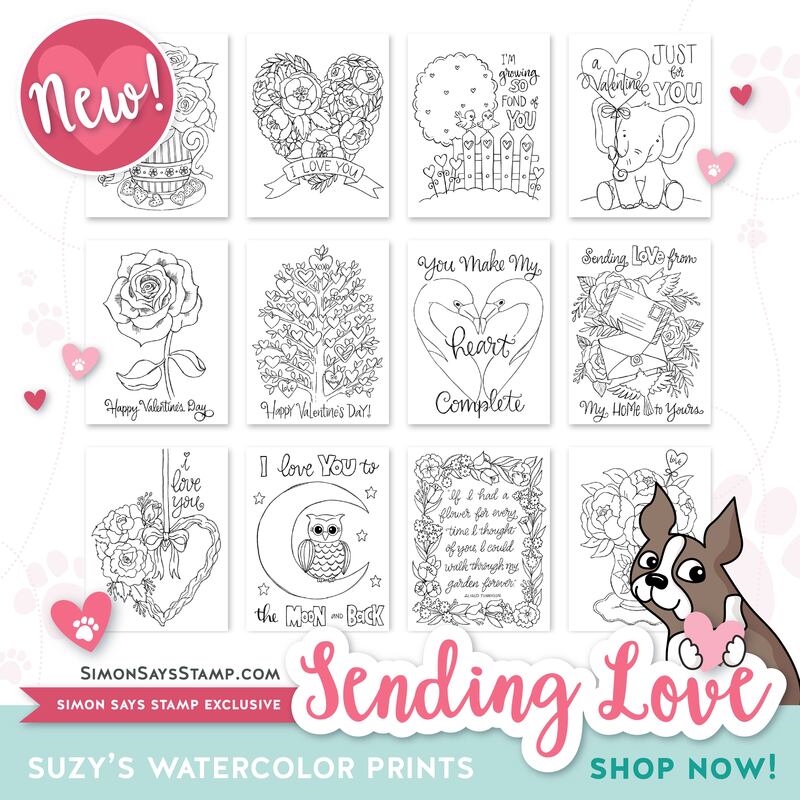 There is also a brand new set of Suzy’s Watercolor Prints called Sending Love, which have just been released! These love-themed prints are perfect for coloring with any medium and can be added onto a card for easy notes to send to those you love! Love the purple color and the glitter. So pretty. Awesome You Are Loved release! AWESOME creations! I especially love how you inlaid the different colored sparkly hearts! great glittery purple card. FUN!! Love the cards! I’m going to copy most of the design because they are the type of card I like to make. I love how you push the limits of a die – such creativity and beauty! 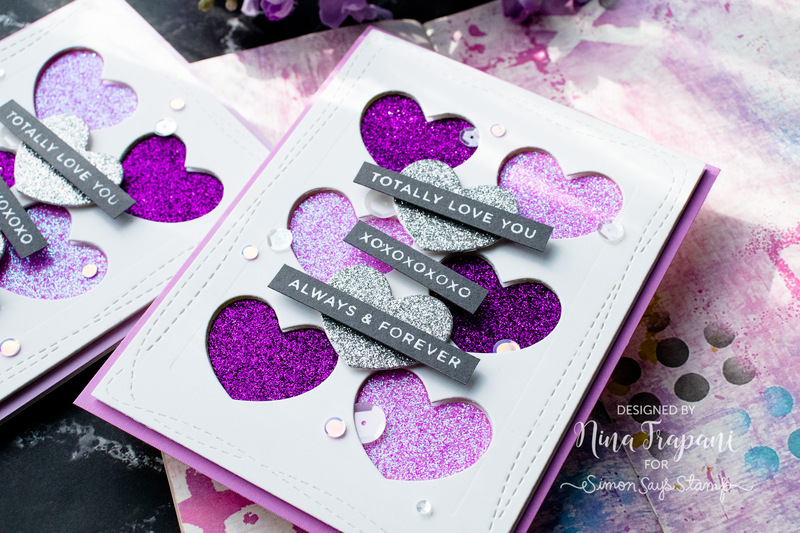 Thanks for sharing your gorgeous glitter heart card–I’m definitely feeling the purple! This new release is lovely, as usual. I need to get a set of those water color cards me thinks. So pretty! Love all the glitter. Very creative idea. Ah…alll that glitter – I love it. I like how you used all of the bits – including the hearts that were left over. Well done! Pretty card! Love this new release! Beautiful cards! What a great way to use glitter paper and a die! Love these cute and sparkly cards! They are gorgeous! Awesome Nina-Marie, your coloured hearts splatters from the card, great colours. Thank you so much for showing and have a great weekend. Beautiful card! I love the glitter and the colours – such a great combination! I love all the glittery awesomeness Thanks for the inspiration!! Love those glittery hearts! Beautiful cards! I love that heart die! 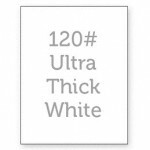 It’s such a versatile piece to use and the glitter cardstock is beautiful. Pretty cards and they look like they came together rather easily. Be still, my glitter-loving heart! Very pretty! I love the Purple Hearts. 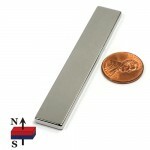 Just order heart dies and can’t wait to start making cards with it. 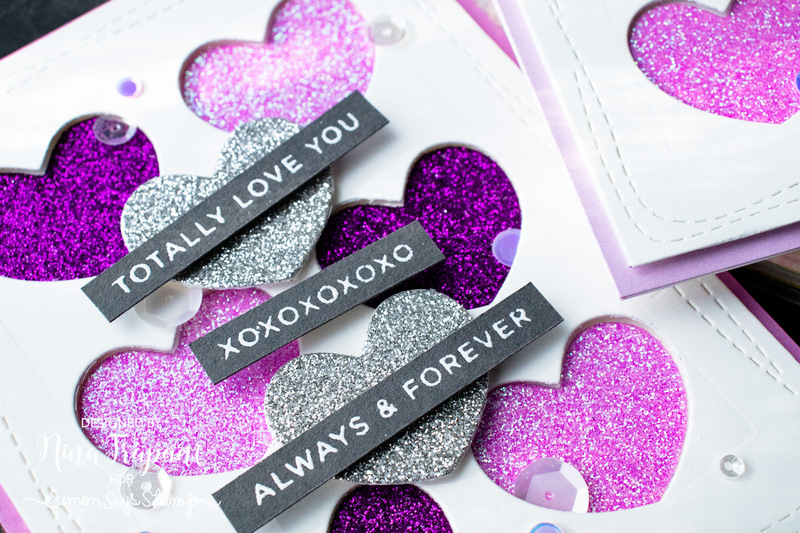 Beautiful glittery heart cards!! Love the purple!! !